12-Dec-2001 -- Actually my ship is berthed in the Port of Kaliningrad/Königsberg, capital of the Kaliningrad/Königsberg District, the Northern part of the former German province of Ostpreußen (Eastern Prussia, until 1945). After WWII German Eastern Prussia has been divided between Russia and Poland, the latter incorporated the Southern Part in it's territory. Since the Soviet Union ceased to exist, Kaliningrad District became an exclave of the Russian Federation, bordered by Lithuania in the North and East and by Poland in the South. 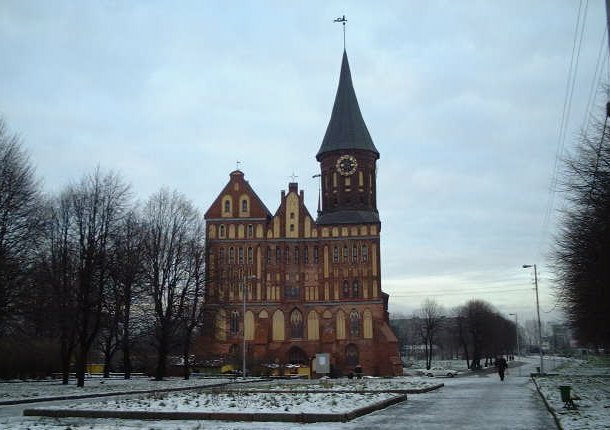 During Soviet times Kaliningrad/Königsberg District was a special military zone, and no foreigners were allowed there at all. Old Königsberg, later renamed in Kaliningrad by the Soviets (according to an early communist official, Mikhail Kalinin (Kaliningrad means "Town of Kalinin"), was the home of the great German philosopher Immanuel Kant, whose "Categorical Imperative'" and "Critics of Pure Reason" became immortal philosophical ideas. Kant spent all his life, from the cradle to the grave, in Königsberg. He never has undertaken a single voyage in his life. His grave is still existing near the Domkirche (cathedral). 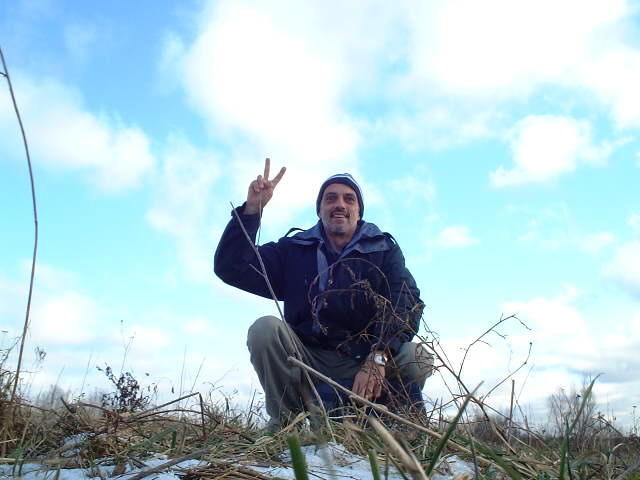 Contrary to Kant I decided to make a trip to the only one Confluence Point in Kaliningrad/Königsberg District, in order to submit the very first point from Russia! Actually here in Kaliningrad/Königsberg my ship is discharging frozen chicken and pork carcasses from Brazil. Due to a lack of refrigerated railway cars, discharging operations go on quite slowly and there is a lot of time. 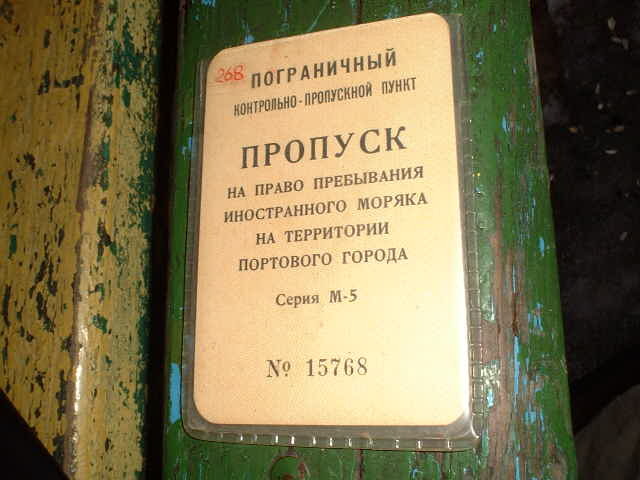 On 12-dec-2001 at 09:00hrs I left the ship and went to the Port gate, where a "Propusk", in cyrillic spelled "ПРОПУСК", has been issued for me. A "Propusk" is a pass, a special permit. The Propusk shown here gives me the permission to leave the seaport and move into the District of Kaliningrad/Königsberg. In the former Soviet Union as well as in today's Russia nothing works without a Propusk. The Propusk shows any controlling authority and organ that you have passed a certain point and delivered properly your personal data there - and having been checked accordingly. From Kaliningrad to Vladivostok and from the White Sea to the Caucasus, Propusks do accompany you all the time, whenever you leave or pass a designated area, like a seaport, a barrack, a manufactory, etc. Without the proper Propusk you cannot go far. Although a typical communist invention, even 12 year after nobody thinks about to abolish this Propusk-system. It has proven to be effective and safe and keeps authorities busy. 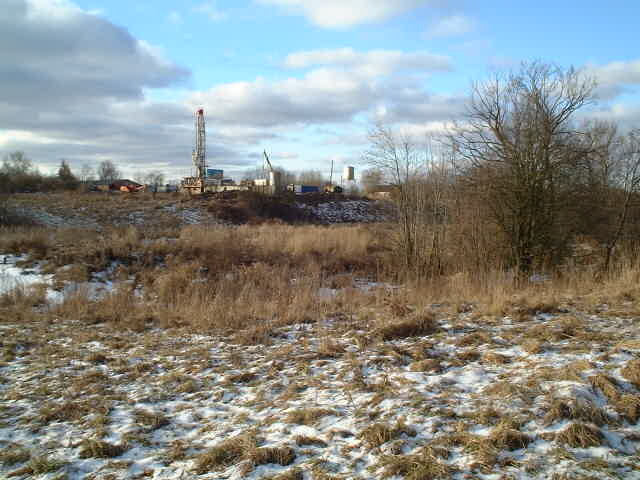 Arrived in Kaliningrad/Königsberg Town I checked out the possibilities to reach the major town near the CP. It is Sovyetsk/Tilsit (I give the original German names after the slash), on River Neman/Ragnit, on the border to Lithuania. Travelling by train was not feasible, there is only one a day, in the evening, and neither did I have time to pass the night in Sovyetsk/Tilsit, nor did I have the permission to stay there overnight. (Remember the Propusk, no respective Propusk - no hotel). Travelling by bus is easier. There are several buses during the day, but then I met Mr. Renat, a taxi driver from Ufa (a 2,500 km away near the Ural Mountains), having just recently moved into the Kaliningrad/Königsberg District - and his knowledge about this province was not better than my one! So first we purchased a map in a kiosk at the bus terminal for a 26 Rubles (95 US cents/1,10€). Precise maps in Russia are considered to be military secrets and are therefore strictly reserved to the army. The ones available do not show much more than commercial ads and a few roads. Topography zero, but I guessed the country anyway to be flat like a pan. The topography should not bear obstacles. Further the map had no Lat/Long grid, but only an alphanumeric one for an easier finding of places. I knew the point to be somewhere South of the town of Neman/Ragnit, and that was enough for the moment. All further investigations could be done on the scene later. The purpose of the map was anyway rather to show the driver where I wanted to go, and in order to negotiate the fare with him. The distance from Kaliningrad/Königsberg to Neman/Ragnit and back seemed to be about 260 km (160 miles) - an indiscutable distance to drive by taxi in a Western country, it would cost you a fortune. But what are 260 km in Russia? Gasoline costs almost nothing, and this distance in such a huge country is just a stone's throw. We agreed on 1,500 Rubles (50 US$, 60 €) and the driver was happy. 50 bucks are fortunately still a fortune in Russia. The first action was to take gasoline. Gas stations are not common overland, only in major towns you find some. So every prudent driver refuels his car before going on an overland trip. Then we started at 10:30hrs and took the State Road A-229 in direction East until Talpaki/Taplacken. There we swung Northeast into the A-216. At Bolshakovo/Groß-Skaisgirren happened exactly what I had inevitably expected already since departure Kaliningrad/Königsberg: The driver was permanently proceeding with excessive speed, and Russian roads are extremely monitored. 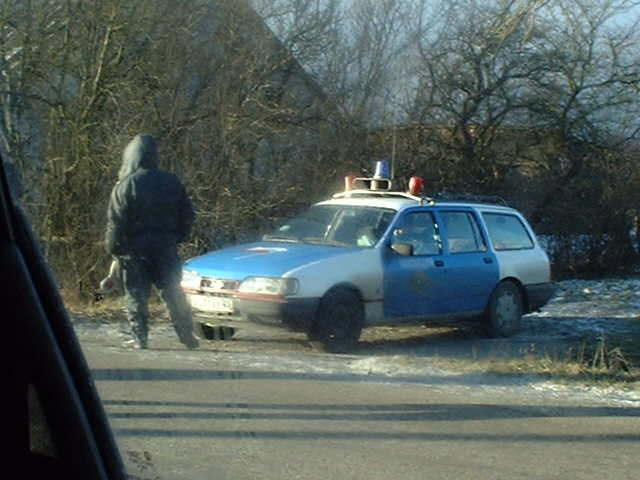 The "Militsiya" (Police) stopped us after having measured his speed with a radar gun. 50 km/h (30 mph) were allowed, and the measurement gave 91 km/h (55 mph). The fine was the exorbitant amount of 100 Rubles! (3 US$ / 3,50 €). 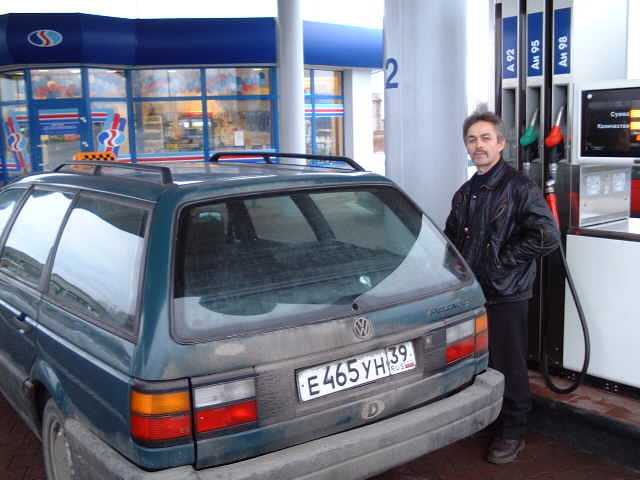 As driver Renat had spent all his money for the gasoline, I had to pay, but deducted it later from the fare, as I was not the one to order him to disregard speed limits, and therefore not felt responsible for this problem. I was only happy he at least passed the alcohol test successfully. I am collecting experiences in Russia for almost 25 years, and one must not automatically and necessarily think and assume a Russian taxi driver still to be sober at noon. Of course this was another opportunity for the authority to check my "Propusk". Finding everything in order we were allowed to proceed. We left the A-216 shortly before Novokolkhoznoye/Neu-Argeningken, and turned Southeast into a provincial road. We passed Gruzdevo/Grott-Brettschneidern, and at Kanash/Iurgaitschen-Königskirch we bent again Northeast in direction Vetrovo/Woydehnen. The roads are not badly maintained (for Russian relations, I mean) and mostly avenues. One must not think that these complicated names stand for big towns or even villages, They are tiny groups of houses, mostly there is not more than a farm with a two to five houses and a war memorial from time to time. 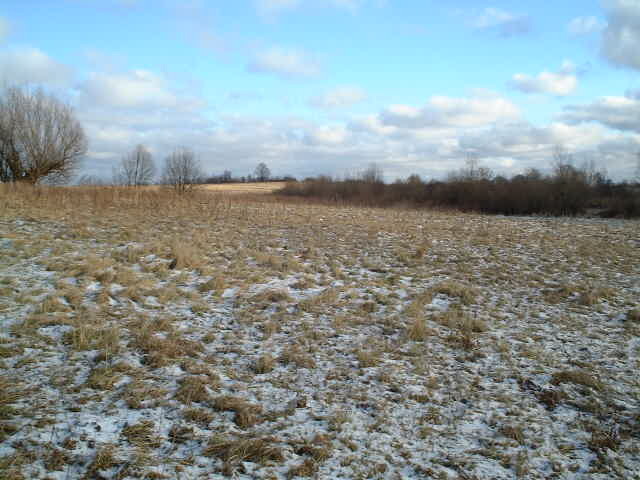 Even during German times Eastern Prussia was almost mere farmland. It was very scarcely populated. The farmers with their farmhands were residing in huge and comfortable farmhouses, and every one owned comparably much land. An urban population was almost not existing (except in Kaliningrad/Königsberg, Sovyetsk/Tilsit, Baltiysk/Pillau, Zhelesnodorozhniy/Gerdauen, Chernykhovsk/Insterburg, Gusev/Gumbinnen, and Ozersk/Darkehmen, just to name almost all). Of course this feudal system has been abolished immediately in 1945 by the Communists, but the country remained mere farmland. 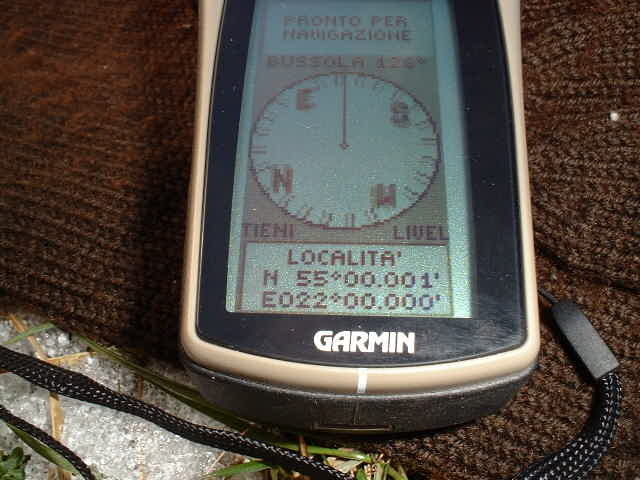 Abt 1 km (0,6 miles) before Vetrovo/Woydehnen we reached 55°00' North. The Longitude was still a 3 km (1,8 miles) too far in the West. So we went into the tiny village of Vetrovo/Woydehnen and turned again Southeast in direction Rakitino/Kurschen. 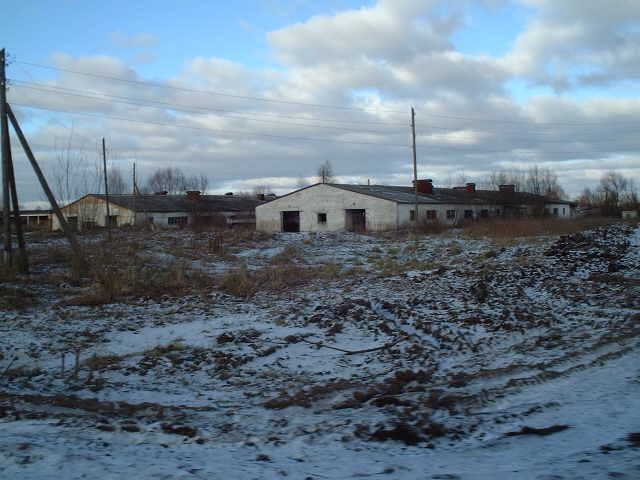 We came closer and closer and then I saw a "Kolkhoz" (Russian governmental farm) - and a dirt road covered with ice into a field, seeming just to be constructed for me. 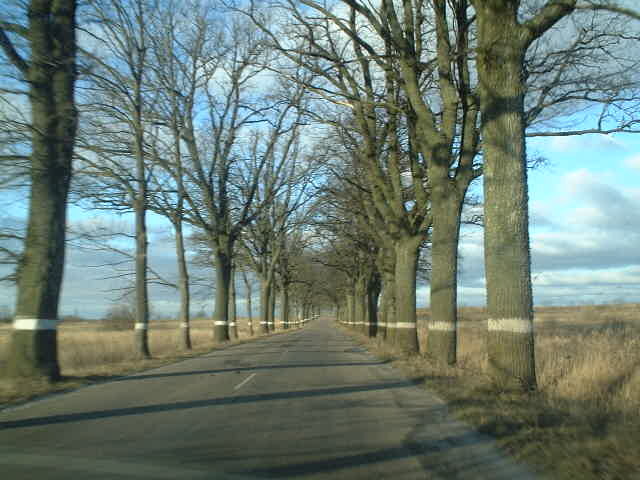 We went into this road and stopped exactly on Latitude 55°00' North and a 200 metres East of the point. THE FIRST CONFLUENCE POINT FROM RUSSIA! I enclose two pictures, one towards East and one towards West, where the Kolkhoz can be seen again. 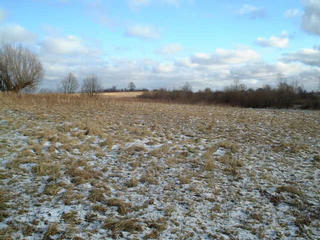 It would have been a big surprise to me the point to offer an exciting aspect in such an almost uninhabited country, but we confluence hunters do know that this is not important. I was emotionally excited, and that counts more. Standing on this point I thought back the many many years I am now already frequently travelling to the Soviet Union and later Russia, especially I remembered the communist times, when nothing was possible, all was forbidden, Militsiya and KGB and all the other organs were real nasty people and could cause you so much trouble. Until the early 90-ies such an excursion could never have taken place. Driving around with a camera, making photos of "military secrets", as roads, railway tracks, bridges, radio masts and farmhouses would have led to immediate incarceration and quite unpleasant treatment and questions. If they found you with a GPS, you could prepare yourself to not seeing again your home and your beloved ones for the next 20 years in the most favorable case, - or if ever - what was more likely, when you ended up in a lead mine in Siberia with forced labor. Russia is certainly still today far away from that what one calls a "free country", but at least officials are no longer so squareheaded. It is probably worth to mention what my driver thought about that strange excursion. Taxi drivers usually do receive clear instructions from their passengers where to go. Fortunately I speak Russian and 260 km on Russian roads are long enough to explain. To him my behavior must have appeared as the typical one for a spy. Making pictures of objects of non-touristical interest and running around with a strange machine, measuring something coming obviously from a "Sputnik" (Russian satellite, literally translated: traveller). But he did not care much, he knew he gets his money and that was it. That I do not get any financial remuneration for my activity!!! That exceeded his intellectual capacity: A crazy man being able to spent a 50 Dollars just for visiting a completely boring place in nowhere land! Make a crash course in Russian language, train to drink vodka in abundant quantities and then go to Russia in your next holidays! There are lots of CPs waiting for you - and Russia is an extremely interesting country and you can have lots of fun with Russian people - if you once have understood and know how to handle them. Who does not want to learn these few words and prefers to talk with his hands and fingers - at least it is indispensabe to learn the Cyrillic Alphabet. Place-name signs are entirely in this font - and you need to decipher them. A Russian taxi driver speaking English is certainly too rare to hope for. Not much Germans are still alive being born in this Province. Practically all of them fled in 1944/45 when the Russian Army occupied the territory. Many of them died during their "Great Treck" towards West, in one of the coldest winters of the century. Almost 10,000 of them died, when their rescue ship, the German passenger liner "Wilhelm Gustloff", sank after having been torpedoed by a Russian submarine. Grüße aus der "kalten Heimat", aus Ostpreußen!